Need more information about booking Home 7442906 ? 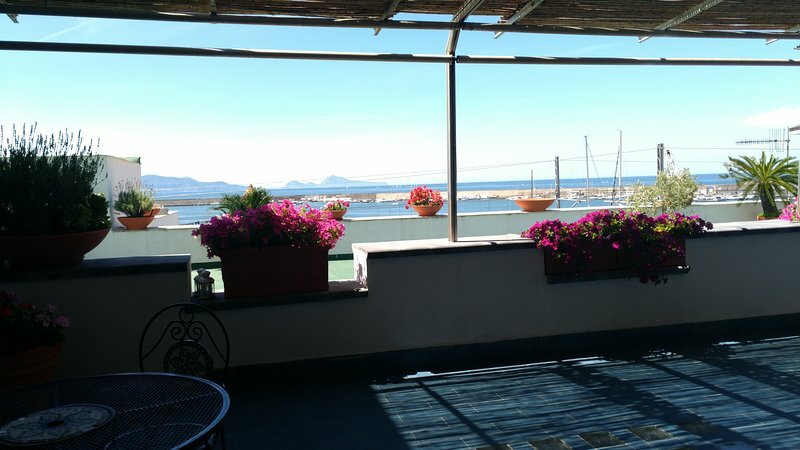 Big sun shaded terrace, totally on the sea front, overlooking the bay of Naples. Solarium for sunbathing on tanning beds. Two double rooms sleep up to 5 people and fully equipped kitchenette. Free high-speed internet wi-fi. Private garage. AC. Bed sheets and towels provided. Very sunny all year round. Perfect location for visiting the region: Pompeii ruins very close-by, Herculaneum, Naples, Sorrento, Vesuvio, Amalfi Coast and the islands of Capri and Ischia. Within 5 minutes walking you can reach: Oplonti ruins, sandy beach, spa, tennis court. Public transportation nearby connecting to the main attractions mantioned above. The building is located in a quiet area, but still very close to the main shopping center. A train rail runs near the building, but trains pass seldom. Noise is very limited compared to the average across the metropolitan area of Napoli. At only 2 minutes' walk there are grocery stores, fresh fruit and veggies market, restaurants,fish market, clothing shops, banks etc. It is a pleasure to connect with our guests just as much as they like. We are happy to give them suggestions or any other information they may require. Several guides, maps and books in foreight languages are available. Pets are welcome, but extra attention had to be paid to not spoil flowers and plants. Estimated price per night based on a weekly stay. Owner fees of $36.00 per stay may apply. Enter your dates to see the total cost.